With a nearby airport, landfill, sewage plant, port and petroleum tanks, Hawaiian Homestead residents in Keaukaha want health concerns addressed. HILO — Residents in the Hawaiian Homestead community of Keaukaha in Hilo enjoy a very nice view — if they’re looking out to sea. Nearly surrounding their neighborhood are industrial and public facilities that no one else wanted — all of them also sited on Hawaiian Home Lands. Some community members call this environmental discrimination and they’re appealing to local legislators for relief. Keaukaha residents every day endure the roar of about 165 commercial and military jets and the thrum of dozens of helicopters taking off from Hilo International Airport, which displaced several Hawaiian families the last time it was expanded. Some of Keaukaha’s residents live across the street from petroleum tank farms. 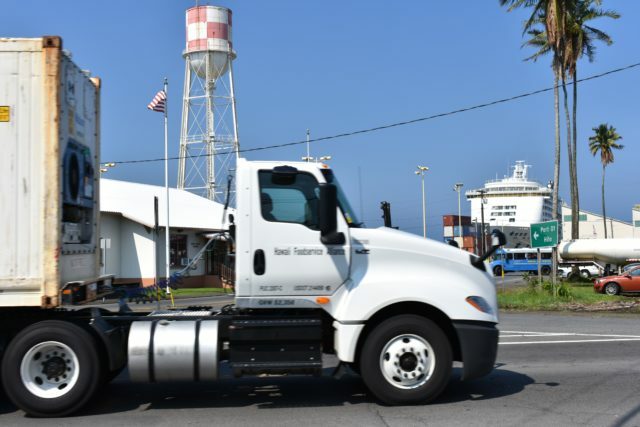 Anyone entering or leaving the community must share Kalanianaole Avenue with semitrailer cargo trucks and fuel tankers entering and exiting the Port of Hilo and adjoining fuel storage terminals. For years, residents have lived with the odors from Hilo’s only sewage treatment plant; from spilled or leaked petroleum products; from the exhaust of trucks and jets, from asphalt plants, and even occasional whiffs from the Hilo landfill. The Keaukaha Action Network, a branch of the Keaukaha Community Association, has been documenting spills, leaks and illnesses, including respiratory ailments and clusters of cancer cases within the community. It’s lobbying for a formal medical study of possible health impacts and proposing that commercial neighbors pay into a fund to cover monitoring, prevention and cleanup costs for industrial pollution. Terri Napeahi, who heads the network, lives across the fence from the airport. Her brother died of lymphoma at the age of 39. Two cousins who lived nearby both died at 37. “On my street alone, several houses have had at least one family member die of cancer,” she said. As for noise, Napeahi said that the state Department of Transportation started a noise mitigation project for residents bordering the airport, but never completed it. Keaukaha residents share their only exit road, Kalanianaole Avenue, with trucks coming to and from the Port of Hilo. The Garcia family lives across the street from Aloha Petroleum and a natural gas tank farm and have been complaining about smells from those facilities for years. Erline Garcia inherited the house after her father died of cancer. Since moving there, she’s developed COPD, a severe respiratory ailment, and lives her life connected to an oxygen machine. She wonders if her problems might be related to the two companies across the street. Connecting such health problems to a specific source is a daunting task. That’s why residents are appealing to the county and state to fund a medical study of the cumulative health effects. Napeahi said that while each facility, by itself, might be tolerable, planners may not have considered the cumulative effect of all those facilities on the community. “It’s like one person smoking cigarettes in the room, and then you have six more (smokers),” she said. In a presentation to a Hawaii County Council subcommittee last July, Napeahi outlined some of what her group had uncovered: her community’s neighbors include at least a half dozen types of “toxic release inventory facilities” such as the airport, harbor, landfill, sewage plant, tank farms and an oil-burning Hawaii Electric Light Company power plant. The group has unearthed EPA cases against at least two of their neighbors: Aloha Petroleum and the Hilo sewage treatment plant. 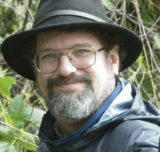 The good news is that those two cases have been resolved, at least to the EPA’s satisfaction, and some other problems are being mitigated. 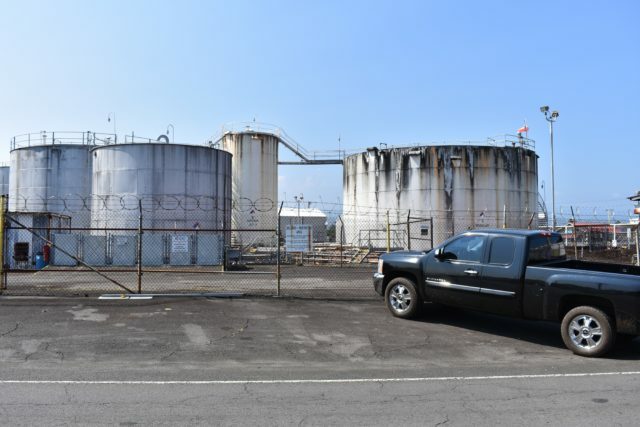 In 2015, Aloha Petroleum was fined $650,000, and agreed to $3.25 million in improvements to its facilities statewide, including its storage terminal at 999 Kalanianaole Ave. At that site, the EPA found that Aloha had failed to install proper “vapor controls” and that its “secondary containment basin,” made of porous coral, would not prevent spilled fuel from seeping into the environment. Casie Bui, Aloha Petroleum’s marketing manager, said that the terminal had been shut down. All of the company’s petroleum products are now entering the island via a second terminal at 661 Kalanianaole Ave., where the company has installed an impermeable liner in its spillage basin. Another alleged pollution problem proved to be a record-keeping mistake. Napeahi’s County Council presentation included a slide, based on an EPA website, showing that the HELCO power plant near Keaukaha had noncompliant with EPA standards for 11 straight quarters. 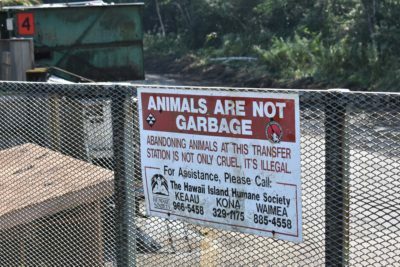 Animals are one thing people can’t legally dump at the Hilo landfill, uphill from Keaukaha. And another problem neighbor, the Hilo landfill, will finally close late this year or early next year. The unlined landfill has leaked leachate into the groundwater and smelly gases into the air since the 1960s. The landfill was supposed to close in the early 1990s, but county officials have postponed that closure by steepening its sides and initiating various recycling programs. When it does close, a cap of plastic, stone and 40-45 football fields’ worth of Astroturf should keep most groundwater out, cutting the leachate problem. Gases from the decomposing pile will be piped to the surface and flared. Napeahi has decided to run for state representative for District 2, but is still working with her opponent, incumbent Chris Todd, on the community’s issues. Todd has introduced House Bill 2276 to fund a second Department of Health water quality inspector (the entire island currently only has one, stationed in Kona). Todd said he also wants to introduce a resolution supporting the cumulative health study residents want. “We don’t want to scare people, but we do want to collect data,” he said. State Sen. Kai Kahele is working on another bill to fund a study of “alternative” methods for Hilo to dispose of its sewage, such as composting, rather than simply pumping the treated effluent out to sea. The Department of Hawaiian Home Lands is working on its own “ERR (environmental review research)” on the community’s problems, but the “final report is not done yet,” said information officer Paula Aila. DHHL chair Jobie M. K. Masagatani testified in support of the Keaukaha Action Network’s efforts during a presentation to a County Council subcommittee last July. When the county wanted to site yet another smelly neighbor — a green waste composting facility — on Hawaiian Home Lands property near Keaukaha last year, the DHHL sided with residents in opposition. The county is looking at alternative sites.